When people think of spectacular fall colors, they usually visualize unbroken vistas of the Smokies or the striking scenes of New England. Rarely the West. Never the desert. 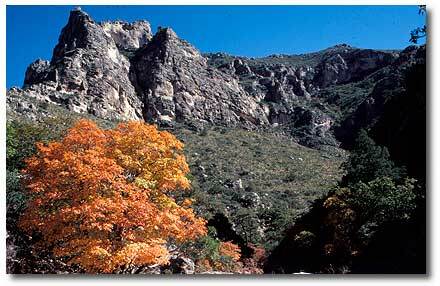 But one of the most colorful displays of autumn color in the nation occurs in the Guadalupe Mountains, which rise out of the Chihuahuan Desert, on the Texas-New Mexico border. The stage for the carnival of colors is McKittrick Canyon, a serpentine slash gouged in the eastern slope of the mountain range. A crystalline stream fills the canyon with perennial moisture, and steep walls shade its environs from the scorching sun. This set of environmental conditions allows plants from the Rocky Mountains, Chihuahuan Desert, eastern forests and Great Plains to merge. The picturesque canyon provides the perfect habitat for big-toothed maple trees, the star performers of the autumn spectacle. 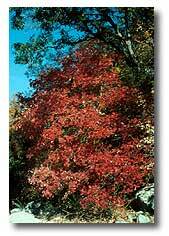 Like flashing lights in a theater, the first nippy days of October announce that the pageant of colors will soon begin. Frosty winds sweep down from the mountain heights. Nightly temperatures drop below forty five degrees, triggering the maples’ shut down of the food factories in their leaves. The stage is set. The green pigment in the leaves begins to fade. Then, with a metamorphosis rivaling the most colorful butterfly, the trees trade their sun-baked green for a wardrobe of burgundies, reds, oranges and golds. The maples provide the main attraction, but walnuts, oaks and choke cherries support the show, while ponderosa pines and Douglas firs perfume the air with their resinous aromas. The pigments painting the leaves are the same that brighten the vegetables on our dinner tables. Anthocyanin, found in beets and red cabbage, creates the fiery reds and vibrant hues of burgundy and purple. Yellow and orange come from xanthophyll and carotene, the color in carrots. 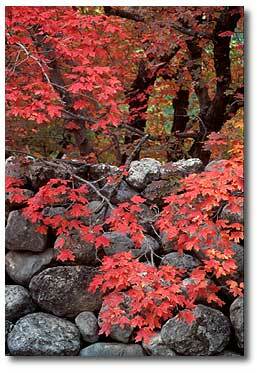 Tannin, the most durable pigment, gives fallen leaves and the tea we drink their brown color. The trail into the canyon begins at the McKittrick Canyon Visitor Center. It gives no hint of the vistas ahead. Instead of colorful woodlands, we hike at first through stunted oaks and junipers accented by the lithe pink limbs of madrone trees. In contrast to the smooth-skinned madrones, alligator junipers have bark furrowed like the scaly hide of reptiles. Once the trail reaches the stream, deciduous maples form a cathedral-like canopy over the winding path, and the pageant of color begins. We ford the ankle-deep stream several times and take dozens of photos of the blushing trees framed against the turquoise sky. The stream pours through boulder jams and the rugged mountain slopes tower higher and higher above the creek. Pratt Lodge Historic Site, 2.8 miles from the trailhead, makes a good lunch stop. It has water, picnic tables and rest rooms. Wallace Pratt, a geologist and lover of rocks, built his house with stones artistically arranged in patterns as colorful as the autumn leaves. Even the roof, built of slate, reflects the delicate woodland hue. The old lodge, surrounded by lofty mountains and colorful maples, has a view unexcelled by any residence in the Southwest. After a restful break in what many consider the most beautiful spot in Texas, we still feel hungry for more of nature's handiwork, so we hike another mile to the Grotto Picnic Area. Maidenhair fern accents dripping stalactites and stalagmites growing under an dripping overhang. McKittrick Creek plummets down the boulder-strewn creek bed creating mini-waterfalls and shimmering pools. Rainbow trout dart upward to ripple the mirrored reflections of crimson leaves and blue skies. The rocky stream bed and sheer canyon walls reveal 280-million-year-old fossils, the evidence of the largest coral reef on Earth. The massive reef once impounded a 10,000-square-mile inland sea. The ancient reef's splendor is revealed in the gleaming limestone cliffs of El Capitan and of Guadalupe Peak, at 8749 feet, the highest point in Texas. The mountains form a pie-shaped escarpment that rises majestically 3000 feet above the desert floor. If hiking is your forte, you will find 80 miles of trails leading into the high country of the Guadalupe Mountains. From atop Guadalupe Peak, reached through a strenuous nine-mile round trip hike, you can see the Delaware Mountains to the south, a part of West Texas’ basin and range country; barren salt flats and white gypsum dunes to the west, markers of the harsh desert between the Guadalupe Mountains and El Paso; and a coniferous forest to the north, a part of the historic wooded mountain homeland of the Mescalero Apaches. The peaks and ridges of the Guadalupe Mountains protect McKittrick Canyon from the arid Chihuahuan Desert, but they cannot hold back the assault of winter. The autumn pageant with its colorful actors runs for a strictly limited engagement, usually from mid-October through mid-November. Then, like a closing curtain, the frigid winds come whipping down the narrow canyon and strip the actors of their colorful wardrobe. 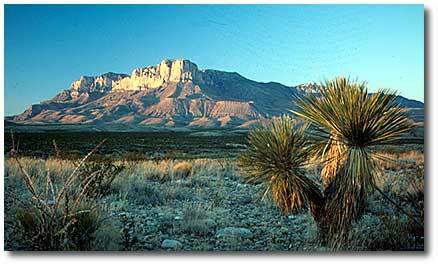 The Guadalupe Mountains National Park is located 100 miles east of El Paso, Texas, or 55 miles southwest of Carlsbad, New Mexico, on U.S. 62/180. The park is open from 8:00 a.m. to 6:00 p.m. Mountain Standard Time from spring through October and from 8:00 a.m. to 4:30 p.m. MST through the winter. The gate to McKittrick Canyon is locked at night. Since year-to-year weather variations can affect the changing of the leaves, call the park at 1-915-828-3251 to inquire about the best time for fall colors. The park has RV parking without hookups, walk-in tent camping and bathrooms. No food or overnight facilities exist in the park. 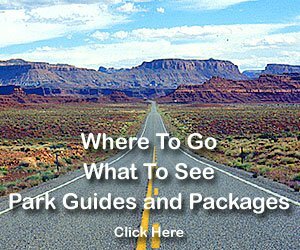 The nearest commercial campgrounds and tourist facilities are located in White City, New Mexico (35 miles northeast), and Carlsbad. Ten back-country campgrounds. A free permit is required and may be obtained in person at the Headquarters Visitor Center or at the Dog Canyon Ranger Station. No fires (including charcoal) allowed in park. No individual camping reservations accepted. Reservations accepted for front country groups of ten or more. Free backcountry camping permits required; horseback riding (bring your own stock) and free corral use (permits required). All permits must be obtained in person at the Headquarters Visitor Center or Dog Canyon Ranger Station on the day of or the day before they are to be used. The movie Stagecoach, in 1939 introduced two stars to the American public, John Wayne, and Monument Valley. Visiting Monument Valley gives you a spiritual and uplifting experience that few places on earth can duplicate. Take a look at this spectacular scenery in this video. Glen Canyon Dam - Lake Powell Held behind the Bureau of Reclamation's Glen Canyon Dam, waters of the Colorado River and tributaries are backed up almost 186 miles, forming Lake Powell. The dam was completed in 1963. Take a look at this tremendous feat of engineering - the Glen Canyon Dam. Canyon de Chelly NM offers the opportunity to learn about Southwestern Indian history from the earliest Anasazi to the Navajo Indians who live and farm here today. Its primary attractions are ruins of Indian villages built between 350 and 1300 AD at the base of sheer red cliffs and in canyon wall caves. Take a look at our Animals index page to find information about all kinds of birds, snakes, mammals, spiders and more!